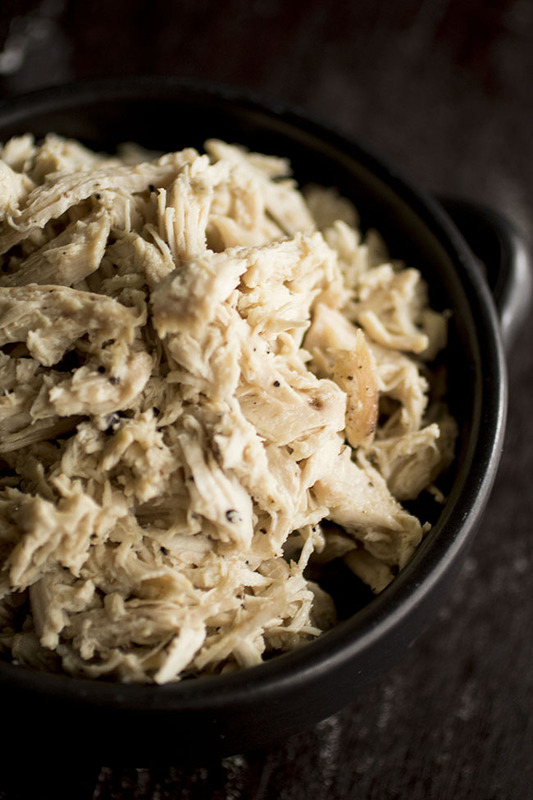 This quick and simple slow cooker shredded chicken recipe is perfect for meal prep during busy weeks! Cook up a bunch of this slow cooker chicken and use it all week long in salads, soups, pastas, and more! Includes step-by-step video instructions. As a special Monday (blergh) treat, I present to youuuuu: Quite possibly the most boring pictures I have ever taken in the history of this blog ever. The “recipe” for this boring-looking chicken (we say “recipe” loosely with the looseness-implying quotation marks because really I am just telling you four ingredients to eyeball and put in a crock pot) but THE “RECIPE” is most definitely, most exceptionally UN-boring, because it is all about saving us ALL OF THE TIMES in the kitchen and also about being a meal prep ninja. Also, I made you a videooooooo! But you have to scroll down to the bottom for that. 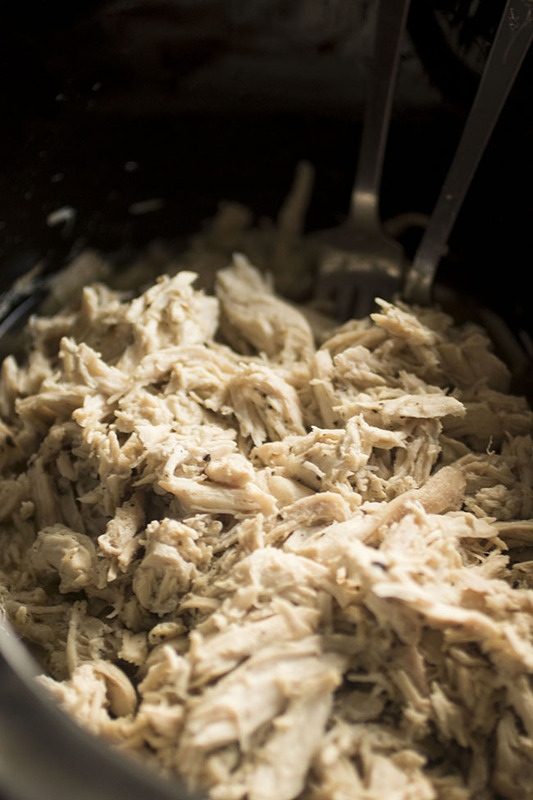 This easy slow cooker chicken “recipe” (again with the looseness) is the way I cook chicken PRETTY MUCH 100% of the time. First, it is easy to make and easy to scale. Second, I am MUCH too lazy to cook separate chicken for separate meals because that would be ridiculous. Third, it frees up my time to do more important things like re-watching all 10 seasons of Friends work and whatever. BUT SERIOUSLY. 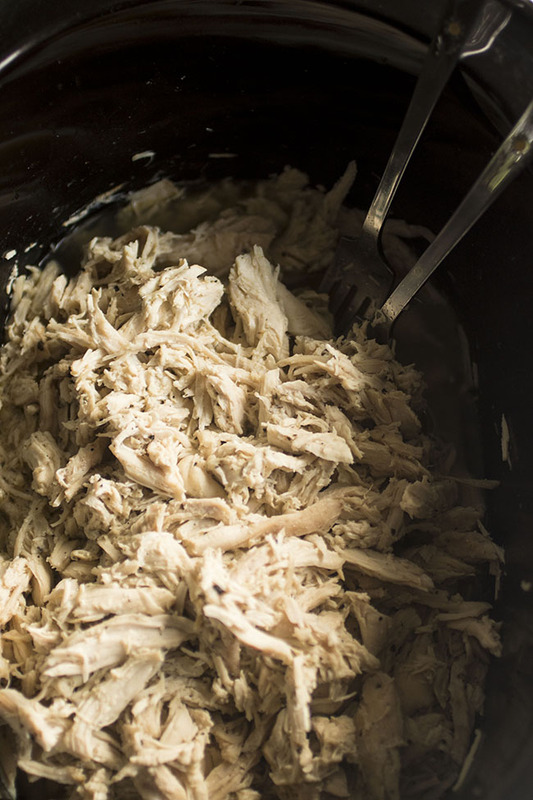 If you struggle with finding time to cook during the week, this slow cooker pulled chicken is a lifesaver. Cook once, and then throw it into your favorite dishes (like Chicken Enchilada Lasagna! Or Chicken Salad Lettuce Wraps! Or this Pesto Orzo Soup! Or ALL OF THE PASTA!) for quick and easy meal prep all week long. 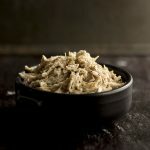 Easy slow cooker shredded chicken to use in recipes throughout the week. Put everything in a slow cooker and give it a toss to evenly distribute seasonings. Cook on low for 6-8 hours until chicken is tender and cooked through. Remove lid and let chicken cool for 10 minutes or so (this is so we don’t burn ourselves). Use two forks to shred the chicken right in the crockpot. I like to leave the broth in there (keeps it tasty and moist!) but you can certainly drain the liquid out if you prefer. Serve immediately or let chicken cool completely before transferring to airtight containers. Store in the fridge for up to a week and use in pasta, pizza, salads, you name it! Make however much chicken you think you’ll eat in a week with this recipe. For two people, I usually make 2-3 chicken breasts at a time, but please adjust the amount based on your family’s needs! 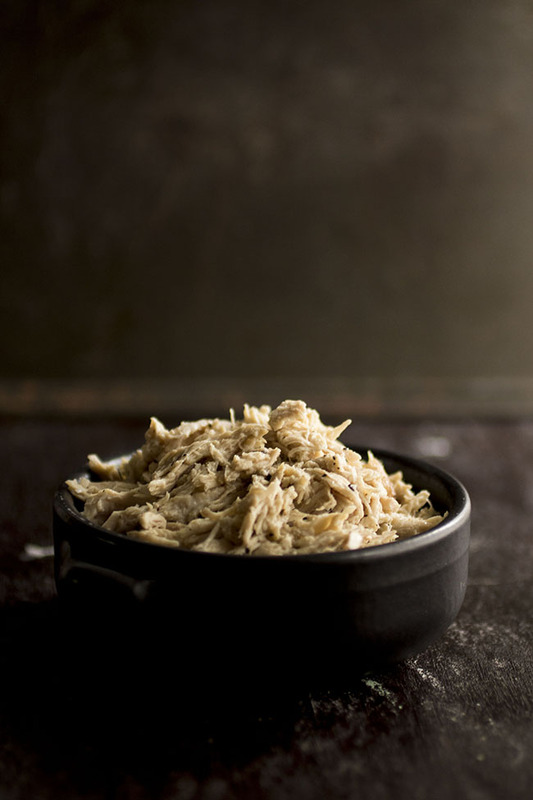 Freeze extra shredded chicken if you like – it holds up fine in the freezer.